NYSCF – Robertson Neuroscience Investigator Michael A. Long studies how birds learn songs to understand how patients might re-learn skills following traumatic injuries. Dr. Long, New York University School of Medicine, followed how one bird species, zebra finch, master a song by imitating another bird’s, tutor’s, song. Science featured the resulting report as its cover story. Following the finches revealed that they learn songs “piece-by-piece.” As they master certain elements of a song, inhibition suppresses learning for already-learned components. Dr. Long’s group measured inhibitory currents in the birds’ brains, which showed that the inhibition signals, rather than correlated to bird age, were related to learning. 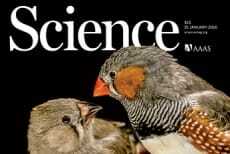 In this picture of song learning, birds imitate what they hear, and as they learn, their premotor neurons show increased activity. Once birds mature, and have learned the song, synaptic inhibition drives down the previous increase in activity in the neurons. By further understanding the mechanism and interplay between suppression and learning activity, researchers can enhance how brain injury patients receive treatment and re-learn lost skills. Dr. Long also authored a study featured in Current Biology on how male and female zebra finches alter the timing of their calls to synchronize their sounds.